Chair covers were once a great alternative and inexpensive way to get that look that couples were looking for. Not so long ago, Chiavari chairs were being rented at a fairly high price! No wonder why so many went with the chair covers instead. We’ve done some research and have found that today the price of a Chiavari chair is about as much as renting a regular folding chair and covering them up. 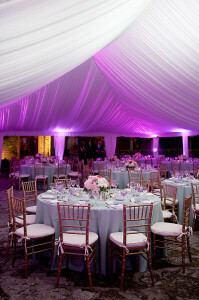 Nowadays, event rental companies are charging half of what they used to charge before. So our question to you is, which one would you prefer at your event; the Chiavari chair or a chair with a cover?